One of the best things about gardening are the lessons that Mother Nature teaches us each day. One of my challenges in this new garden is to grow something I dislike each year in the hope that I will be inspired to eat it… and, who knows, even enjoy it! Broad Beans (fava beans) have always been my nemesis so these had to be my first choice to grow this year. There are three wonderful things that I have discovered since growing these plants. Firstly, Broad Beans have the most beautiful, delicate perfume that fills the air with loveliness and when I first noticed this I was amazed! The smell came wafting over from the vegetable patch on a gentle breeze and it took me a long time to identify that it belonged to the bean plants. My brain would not, could not, believe what my nose was telling it. In fact, I initially started to sniff all the pretty flowers in adjacent beds as I really couldn’t quite believe that these sturdy looking plants could smell so good… and I don’t mean just plain good, I mean “put it in a bottle and wear it as a perfume” good! None of my garden books seem to mention how beautiful these flowers smell and, to be fair, I think that I would grow them for this fact alone! I must say that the garden books in question did worry me silly about swarms of blackfly and also stressed the important of proper support in windy weather. The second wonderful thing (probably related to the first) is that the bees absolutely love these flowers! The big, fat bumble bees seem to particularly enjoy them and they can’t seem to get enough! I’ve grown lots of plants to deliberately attract bees and butterflies to the Nectar Bar but the Broad Beans seem to be doing a better job and our buzzy friends just can’t stay away. I would have thought they’d grow downward too! After all, that’s how most beans grow. I love the flowers! Like you, one of the reasons I decided to grow broad beans this year is because I don’t actually like them! There is a dish you can make with them which I hope to try once mine have finally developed (though it does look like the blackflies have got them!) – can’t remember the name of the dish off-hand except that it is Egyptian. Actually, there might be two dishes – one of them is a dip. I’m actually looking forward to picking the broad beans young and eating them fresh… I had bad experiences as a child with old, squeaky, overcooked beans that were as tough as boots! I love the colour of your flowers so I might look out for that variety next year. The dip sounds good… hopefully the rain will wash all the blackflies away! Yes, young and fresh is much better than old and stringy! The dip I mentioned yesterday is as follows: broadbeans with a small amount of red lentils, lemon juice, olive oil and parsley. There are loads of other dips with beans, so I guess you could substitute any of them for broad beans. 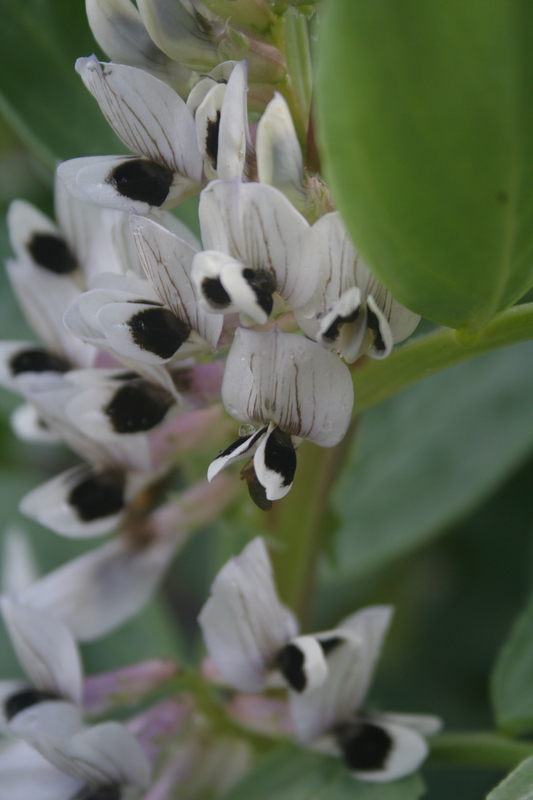 The variety of broad bean I’m growing is called Vicia faba ‘Crimson Flowered’ from Thompson and Morgan. I’ll let you know if they develop beyond the flower stage. PJ — I have done the same thing. Planted stuff I did NOT want to eat with the hopes of acquiring a taste for it. I now eat squash but still can’t quite do eggplant. I’m also growing asparagus but they tell me that won’t really produce in Florida so maybe I won’t have to eat it. Good luck on Implausible. Sometimes it’s just finding the right recipe to use to showcase the veg and hoping that it will be more inspiring when nurtured from a seed! Implausible For Her should be a massive international hit – look out for it in a store near you! The crimson flowered variety that silverbells 2012 has grown are gorgeous! I’ve wanted to try growing these, never eaten before, for ages and now I have my allotment, and have read this post, they are on my list for next year! I’ve really enjoyed growing them and, even if I don’t like the beans when I eat them, I will certainly grow them again next year. Broad bean perfume is a well kept secret. I tried growing an early crop in the polytunnel – wonderful flowers but no beans – our bees don’t wake up until June! However it was worth it for the wonderful scent. I love the vegetable beans very much, now they’re not high but growing fast! the Broad beans I’ve never eaten. Hi Nadezda! Beans are lovely, both to look at and eat! You know, I have found myself eating a lot more fruit and veggies since I started vegetable gardening. I think one reason is that fresh from the garden tastes SO MUCH BETTER than store bought produce! I can’t say I have ever planted anything i didnt like on purpose though, will have to try that next year! Great idea! I try to keep an open mind about things I dislike – tastes change so I thought if I could manage to eat Broad Beans then turnips would be okay the year after. Thanks for saving me from the spam box! That’s good – thanks for visiting from your lovely blog! You have the cutest dog ever! Oh! Lovely! 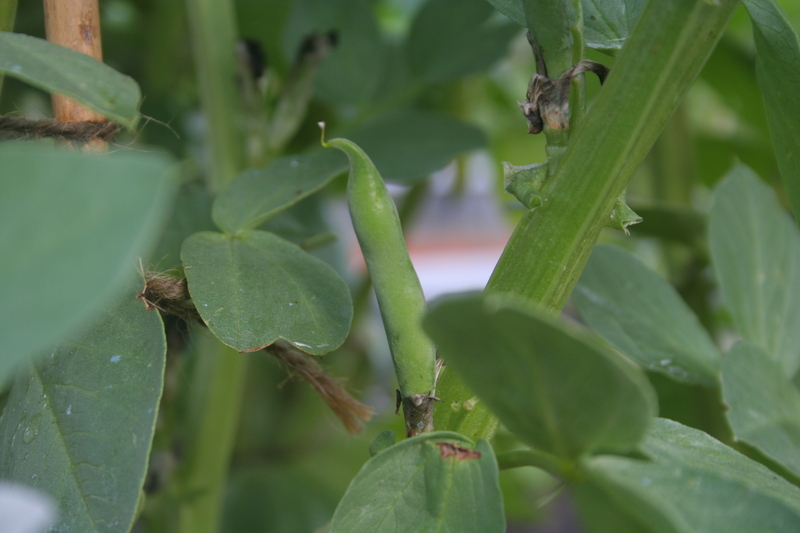 Looks, scent, gravity defiance, and fava beans are a great crop for improving soil. I am totally with you. the flowers are just beautiful. I was suprised too that my broadbeans grew upside down though. I grew them last year for the first time and they were hanging down. so I thought this is normal. I checked the label and last years were called something like ” hangdown green”. if they put it in the name it must be the exemption. I realy like to eat broad beans. I just steam them in the pot, salt them and eat them as a starter. the pods open real easy when cooked. and it is fun ( and saves work) to eat them that way. Great post! After reading this, I will definitely put broad beans on my list for next year. I always buy them dried to make falafel from scratch, and I don’t see any reason why homegrown fava beans could not be homedried… I had no idea about the scent and fava beans attracting bees.